Passenger terminals, ticket counters, baggage screening operations, runways and other facilities at all state airports are being upgraded as part of a $2.3 billion, 12-year airport modernization plan unveiled yesterday by the Lingle administration. No money would be used from the state's general fund, Gov. Linda Lingle said. The plan was developed in cooperation between the administration and the airlines and can be accomplished with the use of airport fees, federal and special funds, revenue bonds, grants and other sources of money, Lingle said. "I think it's a reasonable plan financially," she said. "It's doable, it doesn't take any money out of the general fund and it's going to make for a world-class airport." Some lawmakers expressed concern over the funding. "The only question is the capability of the state in paying for it," said House Transportation Chairman Joe Souki (D, Waihee-Wailuku). He and House Speaker Calvin Say (D, St. Louis Heights-Wilhelmina Rise-Palolo Valley) said they were worried that with the instability of the airline industry in Hawaii and nationwide, airport revenues might not be enough to pay for the project. "I don't like the thought of bailing out the administration's project with taxpayer money somewhere down the road," Souki said. Grand plans for the Honolulu Airport include modernizing its third-level transportation system. 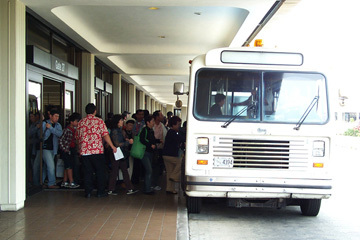 The existing system of Wiki Wiki buses, top, would be replaced with moving walkways, below. Lingle and members of her administration acknowledged that the plan could not be accomplished without increasing some charges, such as landing fees and passenger facilities charges. State Budget Director Georgina Kawamura noted that the first increase in any such fees is not expected until fiscal year 2008. "We still have to work with the airlines to determine what that amount will be," she said. Souki said he was concerned that an increase in fees for the airlines would likely be passed on to consumers in the form of higher fares or food, service and parking costs. Lingle said she recognized that possibility, but added that the proposed upgrades are necessary to help the state's airports meet the growing needs of travelers in Hawaii. "I think you always want to keep fares as low as possible while giving people a safe, modern airport," she said. "It's a balance of these two issues, and we're confident that people, when they see the improvements to the airports, will recognize that they do have to be paid for." The improvements are in two categories: short- and long-term fixes, with priority given to Honolulu Airport and Kahului Airport on Maui. Short-term projects at all airports are scheduled to be completed in the next five years. They include modernization of flight information display systems and security screening operations, new parking structures, building renovations, replacing jet bridges and resurfacing taxiways, among other improvements. Long-term projects are expected to take between five and 12 years and include the construction of additional gates at some airports, more ticket lobbies and baggage claim facilities, and the development of an automated people mover system in Honolulu. » Modernize flight information display system and public address system, and install a new gate management system. » Construct a new parking structure, which will provide 1,000 additional parking spaces and a third-level Ewa Concourse International Arrivals Corridor with moving walkways. » Replace elevators, escalators and jet bridges, upgrade electrical systems and resurface taxiways. » Construct an Automated People Mover system within 12 years. » Expand the ticket lobby and number of check-in positions. » Construct new airport access road to Hana Highway, an alien-species detection facility and cargo buildings, an in-line explosive-detection system and centralized passenger security checkpoint. » Upgrade terminal facilities and expand the public parking facility. » Modernize the security access control and video monitoring systems, and construct an in-line explosive-detection system. » Construct an Aircraft Rescue and Fire Fighting Regional Training facility, wide-body aircraft gates accessible by jet bridges, ticket lobby and baggage claim facility. » Modernize the security access control and video monitoring systems, and construct explosive-detection system. » Improve storm water drainage systems, expand public parking facility, improve frontal road circulation and construct cargo facilities. 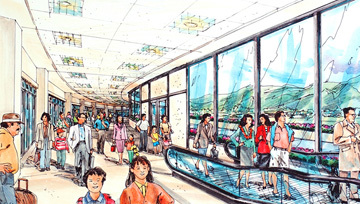 » Replace hold room seating, improve baggage claim facility and heliport facilities, and construct additional ramp space. » Expand passenger security checkpoint and develop a plan to construct additional gates.